The theoretical relationship between exchange rates and relative interest rates is known as Uncovered Interest Rate Parity Condition, or UIP, and is typically expressed in terms of equation (1) below. It says that if the domestic interest rate, i, is greater than the foreign interest rate, i*, then the domestic currency should be expected to depreciate (the exchange rate, s, should be expected to rise) to equalise expected returns in a common currency. If this relationship were not true, then there would be no point in holding the lower interest rate currency, as the higher expected return from holding the high interest rate currency would not be entirely offset by a fall in its relative value (the exchange rate). This prediction from theory is not as disconnected with the popular view described above ̶ that the currency would appreciate ̶ as it may seem. If, say, domestic interest rates increase but the long run expected exchange rate is unchanged, then in order to achieve the depreciation predicted by the UIP condition, the domestic currency has to appreciate initially. So exchange rate theory would also predict a contemporaneous positive correlation between interest rates and exchange rates. In this post we use the UIP condition to see whether the data supports this view, decomposing past moves in sterling into its various components along the way. At this point some readers, academic economists in particular, might be wondering why we are relying at all on the UIP condition given that its empirical failure is a well-established fact in the international finance literature (Fama (1984), Engel (2013)). That’s because this result is related to the framework’s forecasting capacity, and it relies on a simplified version of UIP such as equation (1), which ignores risk premia components that are typically important in financial markets. We argue that while the simplified UIP condition has been rejected from a forecasting perspective, it can still be a useful backward-looking tool to decompose past moves in exchange rates into their various components. The key difference is that our approach is a backward-looking decomposition and not a forecasting exercise, and since there is no estimation involved, we avoid the problems associated with ignoring some components when estimating inherent to any simplified framework. Intuitively it links news in the exchange rate (LHS) to news in the expected path of future relative interest rates, revisions to the expected path of FX risk premia and revisions to the long term exchange rate. This decomposition is useful for policymakers, as they are interested in understanding the underlying drivers behind changes in asset prices in general, and the exchange rate in particular, to better understand what signal to take from these. The decomposition focuses on “news” rather than actual changes as asset prices incorporate all information available at each point in time, and hence only respond to the unexpected component of changes in their drivers. Given that changes in FX risk premia and the long-run exchange rate are typically unobservable, instead of measuring them we back out their sum by subtracting relative interest rate news from exchange rate news, as suggested by equation (2). To assess the role of relative interest rate news in the decomposition outlined in equation (2), we rely on something similar to the R2 of a regression, which quantifies the share of the variation in the left hand side variable that is accounted for by the variation in the right hand side variable. We call this the “A statistic”. Without going into the calculation, if A = 1 then the residuals from the decomposition are zero, and exchange rate moves are fully accounted for by changes in news to relative interest rates. If A is less than 1 – but greater than 0 – then relative interest rates go in the same direction as exchange rate moves but there is a residual. A value less than zero means that relative interest rates typically go in the opposite direction to the exchange rate move – implying that changes in FX risk premia more than offset news to relative interest rates. We should not forget that the long-term exchange rate is another moving part, although we might think that this changes less often. 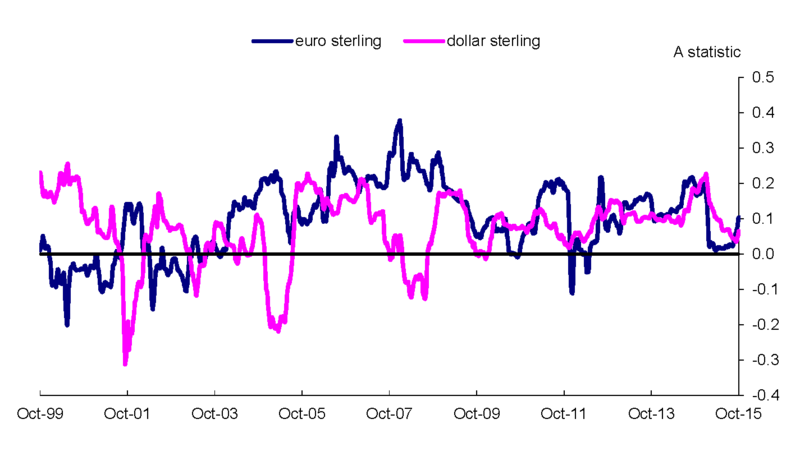 We calculate our A statistic for both the euro pound and the dollar pound exchange rates over a sample period that goes from January 1999 to October 2015 using a rolling window of roughly eight months. (Note: the plot shows the rolling A statistic obtained from considering monthly changes in exchange rates, and monthly interest rate news as measured using 2-yr maturity bonds. The (overlapping) rolling windows containing daily data cover roughly eight months). The chart shows that exchange rates tend to go in the same direction as relative interest rate news. However, the share of exchange rate changes that is accounted for by interest rate news varies significantly over time and is typically quite low. This tells us that time-varying risk premia account for a large share of exchange rate dynamics (assuming that the long-term expected exchange rate does not move around much). The table below shows the A statistic across different horizons and using different bond maturities to measure interest rate news. The figures confirm the results in the chart. Interestingly though, relative interest rate news is more important in accounting for exchange rate changes over longer periods (a quarter or a month, in contrast to a day), and also when measured using short to medium maturity bonds (2-yr or 5-yr bonds, instead of 10-yr bonds). This could be because some of the variation in FX risk premia “cancels out” over longer periods, increasing the importance of the potentially more persistent interest rate news. Also, changes in longer maturity bonds might be a worse measure of interest rate news due to a larger variation in “term premia” (the compensation for uncertainty about interest rates contained in yields). We also find that when there is “big” news in relative interest rates (here two standard deviations above the mean in absolute value) the share of exchange rate moves they account for on average doubles. This might suggest that FX market participants respond more to bigger relative interest rate news, and that the risk compensation they require (reflected in the FX risk premia) does not react by the same magnitude. In conclusion, even if the UIP condition is not fit for the purpose of forecasting exchange rates, it is still a very useful tool for decomposing past movements and assessing the importance of the various components. We find that relative interest rates typically move in the same direction as exchange rates. Most of the time they account for a small share of its variation, which highlights the importance of other factors such as time-varying FX risk premia. However, when there are big moves in interest rates they account for a larger share of the variation in exchange rates. Fernando Eguren-Martin works in the Bank’s Global Spillovers & Interconnections Division and Karen Mayhew works in the Bank’s Macro Financial Analysis Division. Previous Post Could new SME lending policies be bad for start-ups?